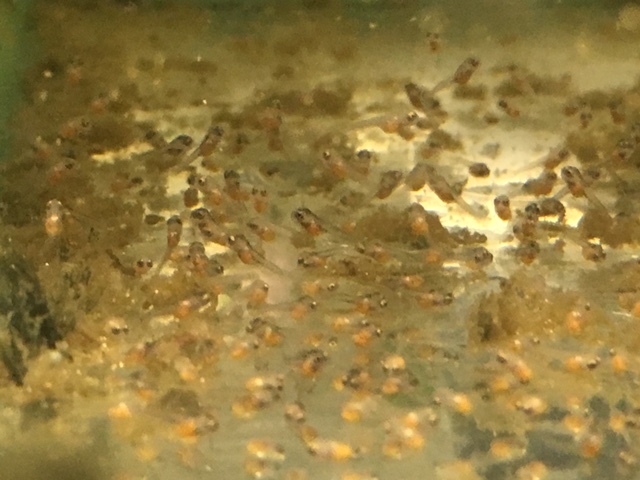 Baby Angels full of brine shrimp. Hopefully I can do better with them than I usually do. When did they hatch? I'm just wondering at what age/stage these were taken as I see little bodies with eyes, but not in the angelfish shape. Do they just look like "wigglers" (tadpole shape) at first, and then acquire the angelfish shape after a certain amount of time? Or do they come out looking like tiny angelfish and I just can't decipher it in the pic? No, btw... I'm not criticizing your camera skills, haha. And they do look fat and full! And what do the parents look like (coloring the babies might be expected to have)? They start out as wigglers, then they absorb their yolk sack and become free swimming. When they get to about pea size they start to look like anglefish. How long that takes depends on feeding and tank parameters. I have a spawn thats getting bigger, but they are just over pea sized.